During our stay at the Ammos hotel in Agii Apostoli, believe it or not I actually surfed for 3 days. Greece is not renowned for surfing at all and I was quite stoked that I managed to surf, during what was supposed to be a non-surfing holiday. After a few days of the sea being like a millpond in front of the hotel I awoke on the 3rd morning to find a little wind swell had created a 1-2ft wave. I had seen a kid’s bodyboard lying around the hotel the day before, so I grabbed it and went out for a little session. I was having a bit of a laugh until I snapped it, it is after all meant for little kids and not a 13.5 stone man! As if by some predestined act, Rose had told me about this â€œsurf boardâ€ she had seen lying on the beach the day before. I walked up the beach and found what was actually a 14ft (ish) wind surfing board (without the sail). Keen to get in the water I picked up the massive board and gave it the once over. It would seem it was going to be a bit of a challenge as the board was huge, had no leash, weighed a tonne, had holes in the deck where the sail is supposed to be attached, no wax (for grip) and no fins on the bottom (which provide traction and thrust to aid in turning the board). Anyway I thought, what the hell I’ll give it a whizz and see what happens. 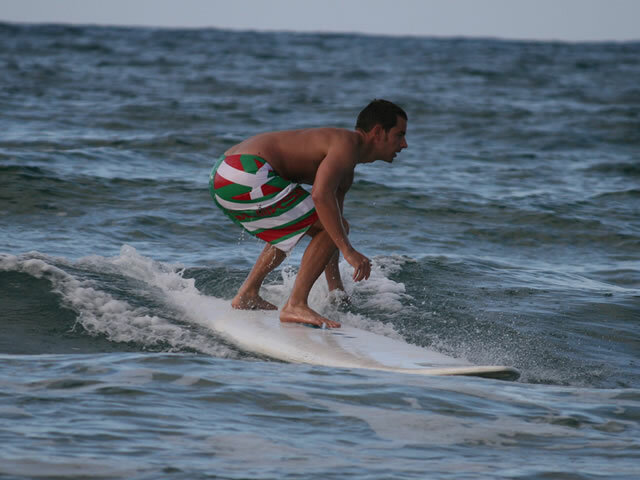 I took the beast out and managed to get a few waves (and the pics to prove it â€“ see below). It was funny riding such a massive and heavy vessel and kind of reminded me of the boards they used to use in the pioneering days of the 1940s-1950s when they utilised heavy redwood and not fibreglass/foam boards. The board handled pretty poorly as it had no fins, so whenever you got any speed the tail slipped out and you started going sideways into a uncontrollable 180 degree turn, eventually leading to a wipe out and in my case cutting my feet open a few times. The other problem was having no leash, so if after a wipe out occurred and I didn’t get to the board in time, it would be washed invariably all the way to the beach, meaning a 100m swim every time (good for the fitness though). But I had fun and the few people who walked along the beach stopped and watched for a short while at this crazy English surfer trying to get some waves. 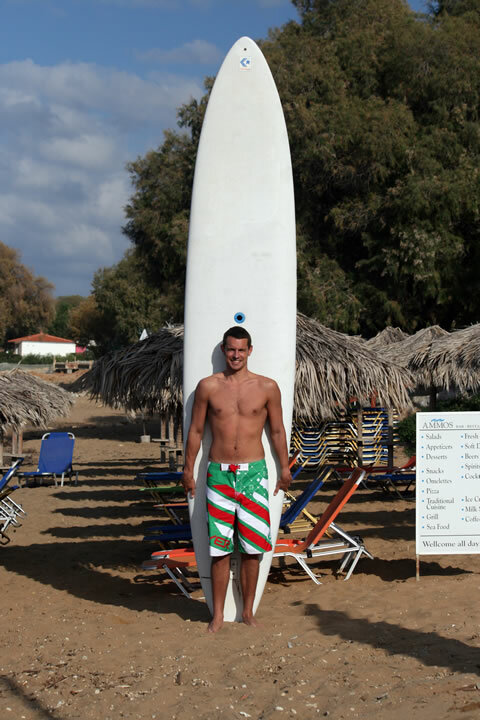 I am not sure if I was the first person to surf (not windsurf) at Agii Apostoli in Crete, but I felt kind of pioneering. For 3 days I had the water totally to myself, which is a rare occurrence these days, possibly the surf gods giving me something back for all the crap conditions we’ve had in the UK over the past few years.